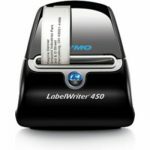 When you own a Dymo LabelWriter 450 and already have a webpage containing the address information of all of your contacts you might think: Would’nt it be nice if I could print my address labels directly from the webpage? Until a couple of years ago this was possible using a browser specific Dymo plugin and some java scripting. This was all working fine … until … most browsers stopped supporting the NPAPI (which is/was required by the Dymo plugin). Luckily Dymo created the Dymo Label Web Service. This is a service that can be installed on the workstation that is connected to the Dymo LabelWriter. Via this service the connected LabelWriter can be controlled from any location.